If you’re a light sleeper or frequently sleep during the day, sleeping after the sun comes up can be very difficult. When you have regular blinds or curtains, light and noise generally still find their way through your window. Excessive exposure to light and sounds can significantly disturb your sleep cycle. This disturbance can cause you to have lower quality sleep, wake up more frequently, and feel much more tired when it’s time to wake up. If you suffer from disturbed sleep, blackout curtains are an excellent, easy solution. 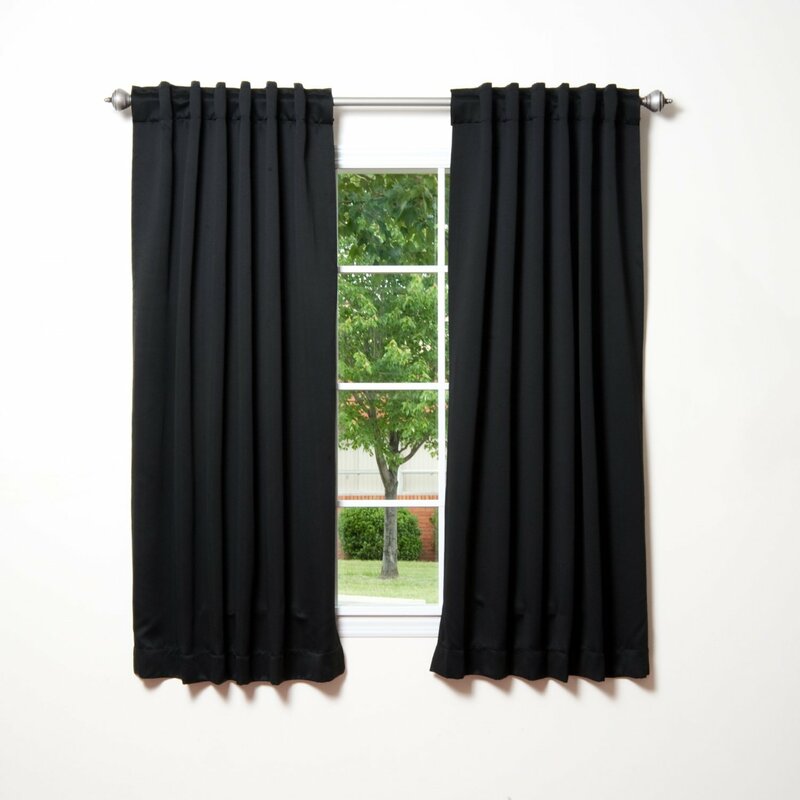 The primary benefit of blackout curtains is that they block light from reaching inside your home when it is unwanted. Some of the best blackout curtains block out more than ninety-nine percent of light. However, these curtains have many other benefits as well. 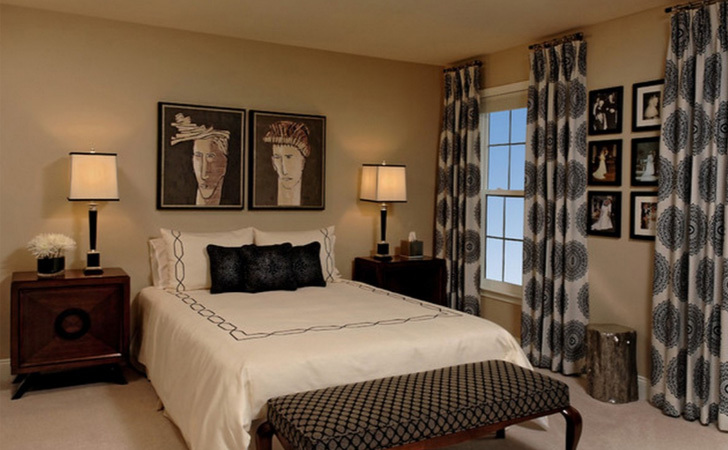 Blackout curtains reduce outside noise that would otherwise come through your window. They also help you save money on energy costs. The curtains prevent thermal loss by trapping heat in your home in the winter and keeping air conditioning inside during the summer. Read the following Blackout Curtains reviews to buy your favorite one. These blackout curtains keep light and sound out of your room and heat and air conditioning inside. They keep more than ninety-nine percent of disturbing light and harmful UV rays from getting through your window to shine into your home. The curtains also minimize noise levels inside your room by reducing outside sound by ten to twenty dB. The curtains are crafted from three individual woven layers in order to prevent any light or sound from getting in and keep heat and air from getting out. They feature ultraviolet semi fiber technology that works specifically to keep UV rays from penetrating the fabric of the curtains. 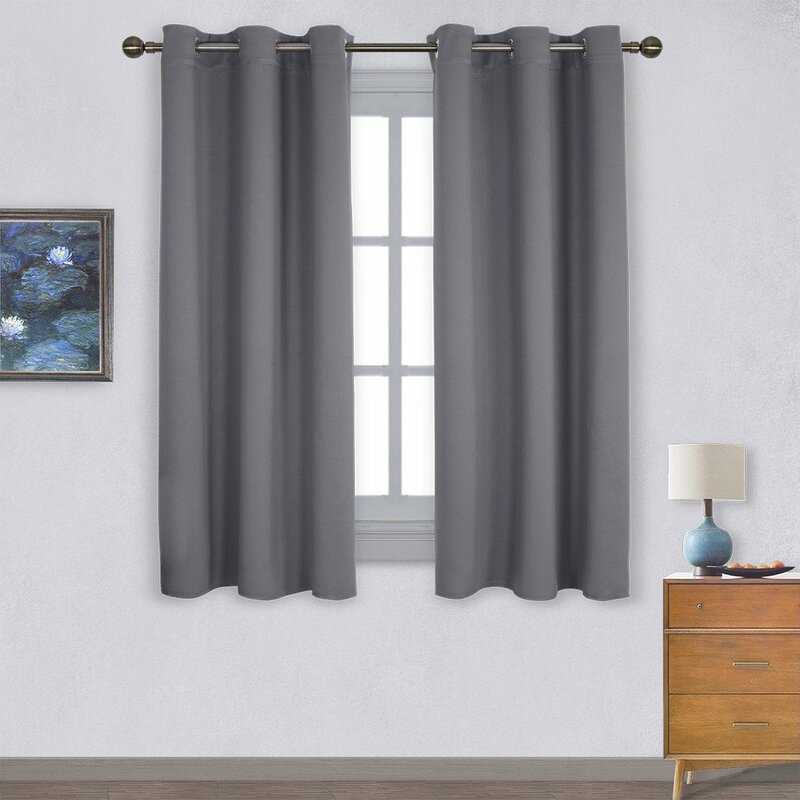 These curtains come in many different colors, including dark blue, black, gray, tan, and more. Their care is easy; when they get dusty or dirty, you can wash them in water above temperatures of thirty degrees Celsius. One of the problems with many blackout curtains is that, even if they are effective, they aren’t attractive and clash with the rest of your home decor. These blackout curtains have the benefit of being effective as well as attractive. They are available in multiple colors, including navy, gray, and beige, of the pleasant, contemporary pattern shown above. These blackout curtains feature a thermal top. This thermal top increases the energy efficiency of the curtains and helps them keep your heat and air conditioning inside your home. The curtains also block up to ninety-nine percent of light and sixty percent of noise from penetrating them to get into your home. You can wash them in a standard washing machine with cold water and tumble dry them on a low setting for easy maintenance. 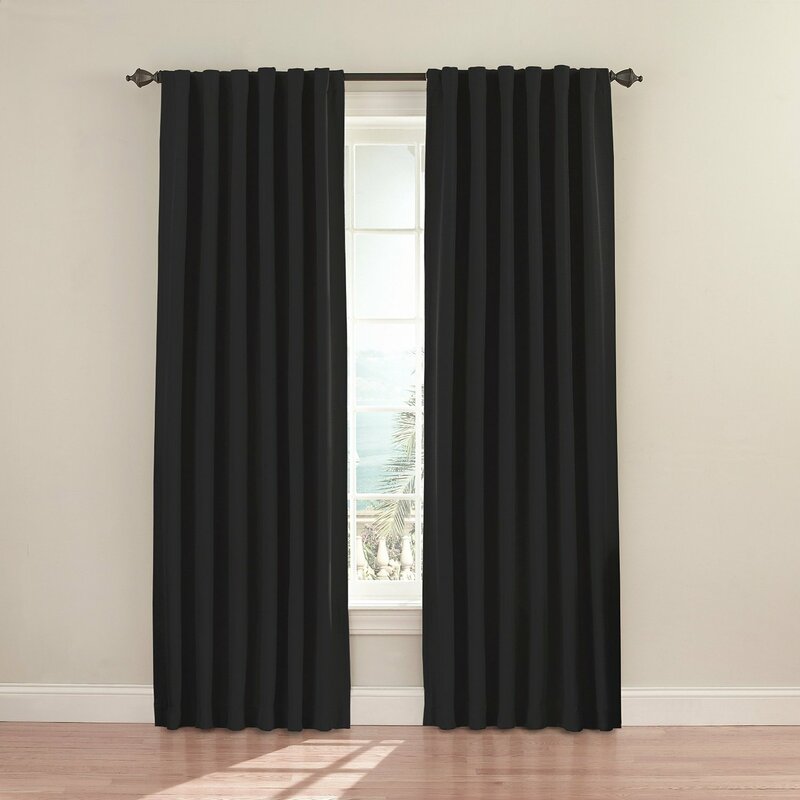 Equipped with microfiber thermal coating, these blackout curtains are extremely effective at insulating your home. They keep both cold and hot air inside to keep your home at a stable temperature that isn’t effected by outside weather. The curtains block ninety-two percent of light and UV rays and keeps out up to ten percent of outside sound. 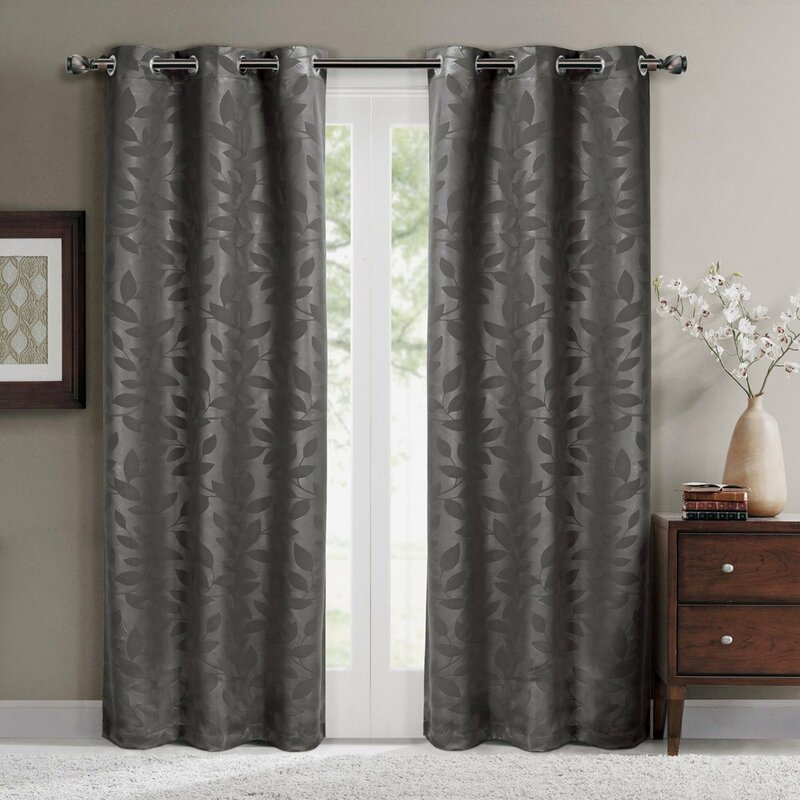 These curtains come in a wide variety of neutral, bright, and dark colors. The available colors include gray, dark red, light pink, turquoise, tan, gray, olive, and many more. The curtains are machine-washable and come and stay wrinkle free. These blackout curtains have the potential to save you a significant amount of money on home cooling and heating costs. They are energy efficient and help keep heat and air conditioning inside your home in order to stabilize your indoor temperatures. The curtains are equipped with triple yarn layers and block approximately eighty-five percent of light from getting into your home. 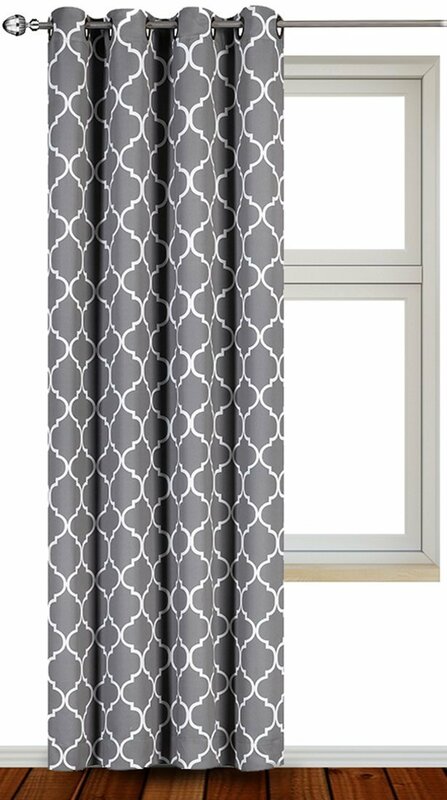 The curtains have an embossed design and are available in many different colors, including gray, white, turquoise, red, and more. They are crafted from one hundred percent polyester and are fully machine washable. 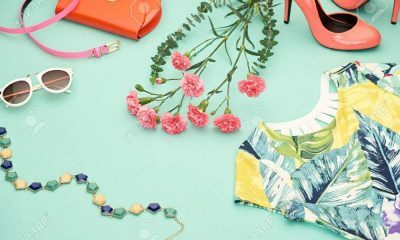 Just make sure to wash them in cold water in order to preserve the richness of the fabric’s colors. 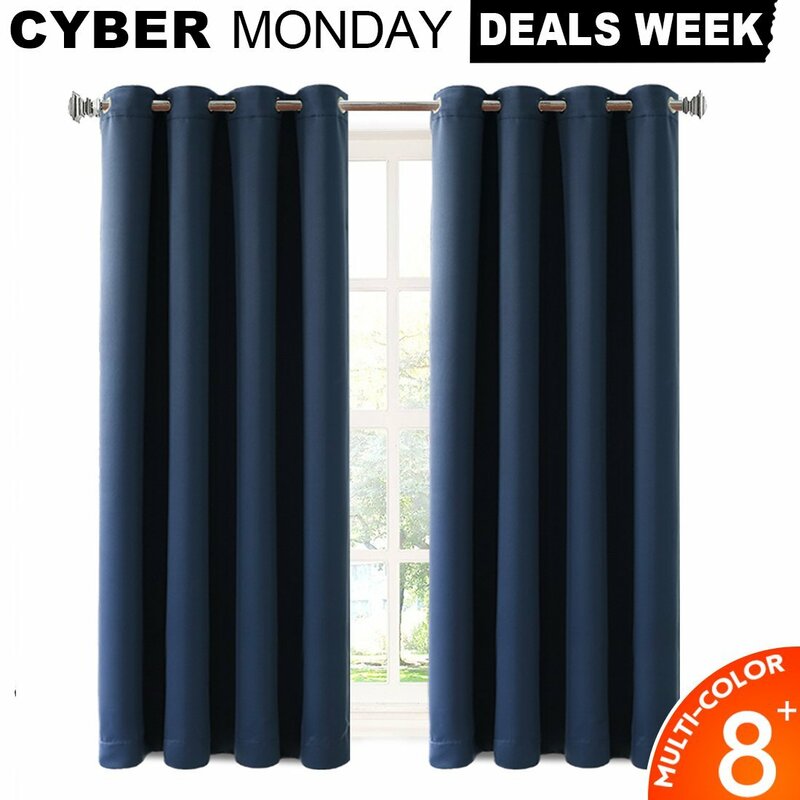 These blackout curtains minimize the amount of money you have to pay in monthly energy costs for your home. During the winter, the curtains trap heat inside to keep your house warm. In the summertime, they preserve the cool air in your house to keep it pleasantly cool. The curtains also block up to ninety-nine percent of light and reduces outside sounds by up to forty percent. The curtains are sold as a single panel. You can buy one or two panels per window you want to cover depending on the amount of coverage you want to achieve. 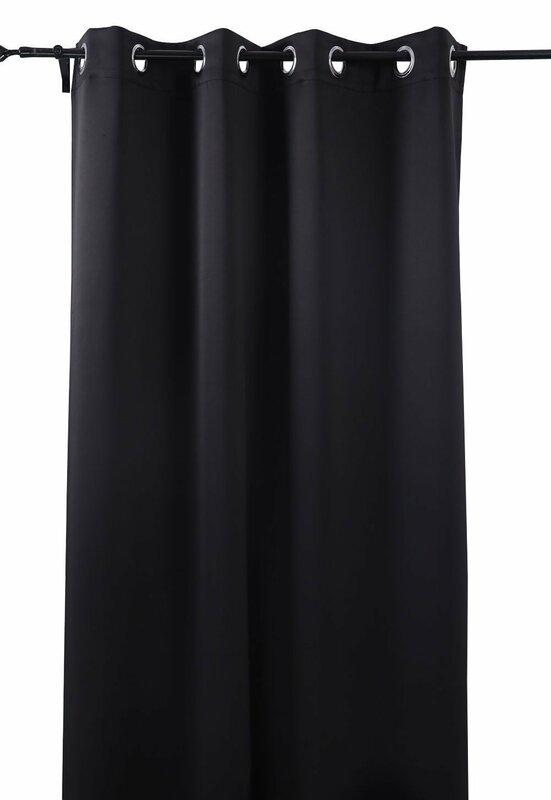 Available in many different dark colors, the curtains come in black, gray, and brown. The fabric of these curtains is one hundred percent polyester and they are completely machine washable. They come in more than thirty different colors, one of which is sure to perfectly complement your home decor. The available colors include turquoise, dark blue, light blue, green, gray, red, orange, pink, black, and many more. In addition to being pretty, these curtains are very effective. They block the majority of light from entering your room, no matter what time of day it is. Plus, the curtains keep your home quiet and help save you a significant amount of money on monthly energy costs. You’ll never be woken up by the sound of insects, cars, or other disturbing outside noises again with these insulated blackout curtains from Deconovo. Even if you’re an incredibly light sleeper, the curtains prevent you from being woken up at any time of day or night by outside light and sounds. Statistically, these curtains block more than ninety-nine percent of sunlight from reaching into your room. The curtains come in many different designs, colors, and lengths. Available colors include black, purple, green, white, turquoise, and more. 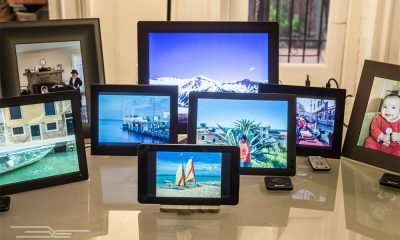 They come in three different sizes: fifty-two by sixty-three inches, fifty-two by eighty-four inches, and fifty-two by ninety-five inches. 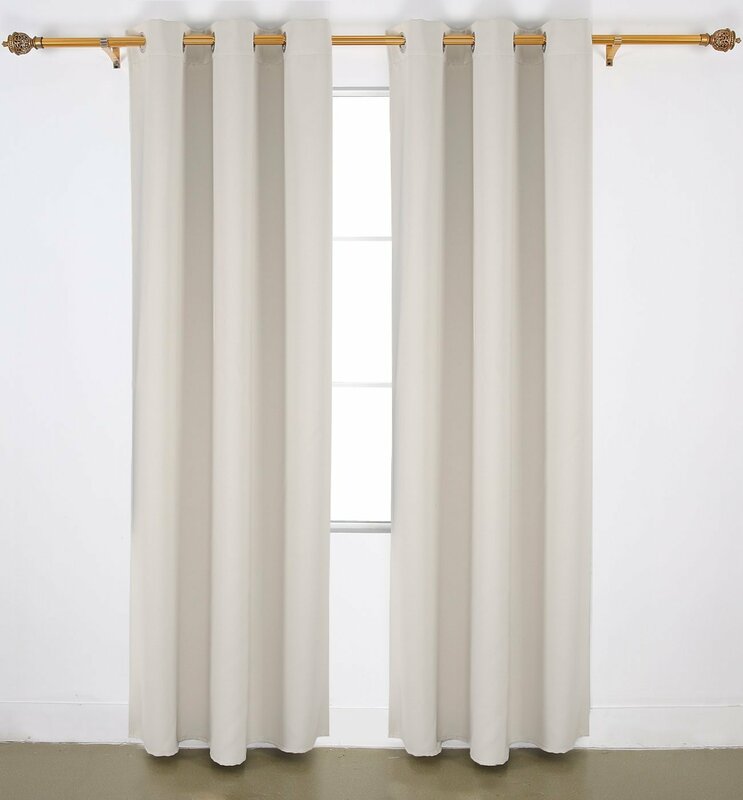 These blackout curtains are equipped with an innovative triple weave fabric design. This construction not only prevents light from creeping through your window when you’re trying to sleep. It also blocks UV rays, insulates against heat and cold, and reduces outdoor noise. All of these benefits work together to allow you to achieve more consisent, higher-quality sleep no matter how light of a sleeper you are or at which time of a day you’re trying to sleep. The curtains come in several different colors that range from light blue and tan to dark red and black. They are machine washable and measure fifty-two by sixty-three inches. Can you imagine getting long, high-quality sleep every time you close your eyes? Because they keep light and sound outside your home and heat and cold inside, you can achieve this lofty goal with blackout curtains. Blackout curtains can transform your sleeping experience for the better. Once you try them, you’ll never turn back. Disturbed sleep and tired eyes will be a thing of the past. Instead, you’ll feel fully rested and ready to take on the day, every day.